Five years ago, I remember seeing Anoli Perera’s “Dinner for Six” (2008) as part of “Home Spun,” an exhibition held at the Devi Art Foundation in New Delhi. The work resembled a traditional dining room setting, replete with neatly placed crockery, plastic flower arrangements and black-and-white portraits. 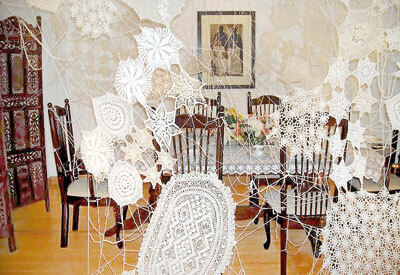 The viewer could only see the installation, however, through a suspended web of white crocheted lace. The interknitted fabric, engulfing the entire ‘set,’ evoked a sense of wonderment with its patterns, nostalgia with its old-world charm and claustrophobia with its mesh-like quality. What struck me the most was the timeless and haunting nature of the piece; how it spoke to the comfort and confines of a space from which women are supposed to operate, dominate and negotiate. Learning more about Perera’s oeuvre revealed that her fascination with needle-point and spiders’ webs is inspired by maternal traditions and the revered artist Louise Bourgeois, respectively. In her writing, she explains that by researching and understanding “the social and cultural conditioning that defined [women’s] ways of art making” she began to reassess her own practice – and those of the “few women artists” around her. Looking again at “Dinner for Six,” in the context of her artistic, written and curatorial engagement in South Asia makes one consider its wider resonances. While the work is clearly explorative of the problems and power within the familial domain, it also points to linkages between art and craft, and the larger gaps in discourse on women in art history. Instead, these artistic mentors have tried to develop practice via successive workshops (e.g. the “Women Artists Colloquium,” 2005-2007) and document historically overlooked artists (e.g. “Reclaiming Histories: A Retrospective Exhibition of Women’s Art,” 2000). The latter was staged by Vibhavi Academy of Fine Arts (VAFA), which also had a wing called the Association for Women Artists (AWA) for some time. The lack of visibility of women in art is an issue echoed by Kumudini Samuel, a founding member of the Colombo-based Women and Media Collective (WMC). While several cultural practitioners I spoke with cited familial pressures and domestic responsibilities as reasons for their supposed disappearance, Samuel reminds us that these are “easy answers” and that more research is needed. Having said this, the WMC’s role in promoting women in art is not to be underestimated; since the early 1980s they have hosted a number of art exhibitions, photography shows and film festivals for women. The organization has also maintained strong networks with other South Asian women’s movements exchanging and strengthening ways in which to engage publicly. On one of the recent covers of Options is a striking, monochromatic image, taken by artist Menika van der Poorten, of dancer and performance artist Venuri Perera. The latter is trained in traditional Kandyan disciplines as well as contemporary dance, and is a wonderful example of someone experimenting and pushing her art practice in Colombo. Aware of the dearth of exhibition spaces surrounding her, the performance artist helped to initiate the Colombo Dance Platform in 2010 with the Goethe Institut, and has since taken part in festivals in Paris, Dhaka and Tokyo. Last year, she performed a piece called “Excuse Me,” (2015) as part of the Theertha Performance Platform 2015, in which she observed and photographed bystanders’ responses to being publicly dressed in a white singlet and short skirt. The idea of looking beyond stereotypical ‘women’s issues’ also surfaced at a recent talk on “Engendering Transitional Justice in Sri Lanka,” held by the Law and Society Trust. Panelists trying to digest the current process of ‘Transitional Justice’ talked of how justice for women could only be achieved through looking at more nuanced narratives and readings of the recent past. Despite women often being absent or underrepresented in public and political spheres, they said, this phase of mediation and moving on could not happen without their input. When we spoke later, Samuel broadened this notion, by saying that to truly understand overarching concepts such as reconciliation or memorialisation, you need women – and you need the arts. Going by the many discussions on socio-political change being held across the city at the moment, it certainly feels like a time of renewed potential and plurality. Perhaps it is the right moment to be redressing such questions again – on the invisibility, stereotyping, tokenism and participation of women – and maybe one of the ways that this can be done is through art itself. Art can have the ability to address the complexities of the now in an accessible, intimate and sensitive manner; at best it connects with you in a way that surprises you – or asks you to look again. In the case of “Dinner of Six,” one wonders if it acquires a heightened resonance at a time like this. In Sri Lanka’s current moment, could it be asking us to re-think the dualities of the conventional private and public space altogether? What if it is not about replacing one space with the other, as traditionally assumed, but one feeding the other instead? What could new forms of engagement for women in Sri Lanka look like – in art, politics and otherwise? It’s clear that many cultural practitioners in Sri Lanka have looked at such issues before, from the creation of platforms for women in art, to making sure women have been included in various peace-building processes. For many reasons, we are here anew, in a time where multiplicity is being encouraged and the possibilities for a transformative future seem possible again. The answers to some of these questions can only be worked through by more women joining in the conversation – and there seems like no better time than the present.